Demolition of the marine foundations of the San Francisco-Oakland Bay Bridge's old eastern span finished Saturday, Caltrans said. Demolition of the marine foundations of the San Francisco-Oakland Bay Bridge's old eastern span finished Saturday morning with just one small blip caused by an errant seal, a Caltrans spokesman said. 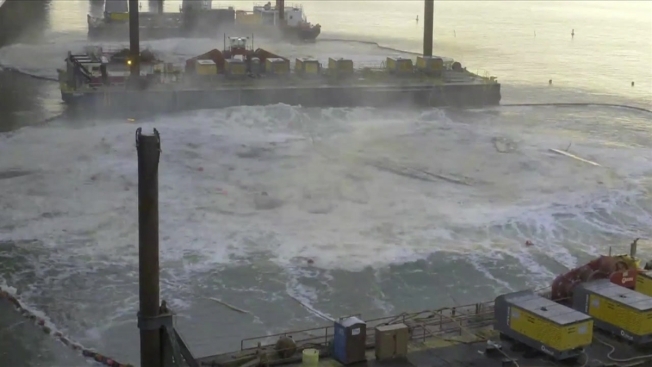 Piers E17 and E18, the final two piers, were successfully demolished this morning at 7:30 a.m., a spokesman said. "It went well, it went according to plan," said Alejandro Lopez of Caltrans. However, there was one minor hitch caused by a seal. "We had a slight delay because the seal was spotted in the exclusion zone," Lopez said. "We had marine mammal watchers on scene. We followed protocol, and after the animal left the area, we were able to successfully complete the implosion at 7:30 a.m."
The series of implosions to demolish the 1936 concrete structures took place over six weekends this fall, starting in September. Caltrans combined multiple piers on certain demolition dates, allowing the demolition work to be completed a year ahead of schedule, saving taxpayers nearly $10 million, the agency said. There was a traffic break on the bridge this morning to accommodate the implosion, but traffic quickly returned to normal after the implosion, Lopez said.